Actors Kim Bum, Lee Kwang-soo and Lee Dong-wook are being called from all over the Asian region. Kim Bum recently finished a Chinese promotion. He attended the red carpet event of the 5th Beijing International Film Festival for "The Beloved", a Chinese movie he lead-starred in. He also attended production presentations for "Show Me A Movie If You Love Me" and had interviews with local media. Kim Bum's progress into the Asian market has great meaning. He is already a known Hallyu star in Japan and is now expanding his territory into China. The fact that he tries to communicate in Chinese and stars in Chinese films to build his fan base played a big role in helping him settle in. His efforts made him seem friendly and his web drama "Beauty Generation" recorded an accumulated number of 419,540,000 views. Lee Kwang-soo has appealed to Asia as a friendly character through the SBS TV show "Running Man". He's popular all over China, Taiwan, the Philippines, Singapore, Malaysia and other countries. His dramas made huge successes and his name was even listed in KOTRA's list of important Hallyu marketing methods worldwide. 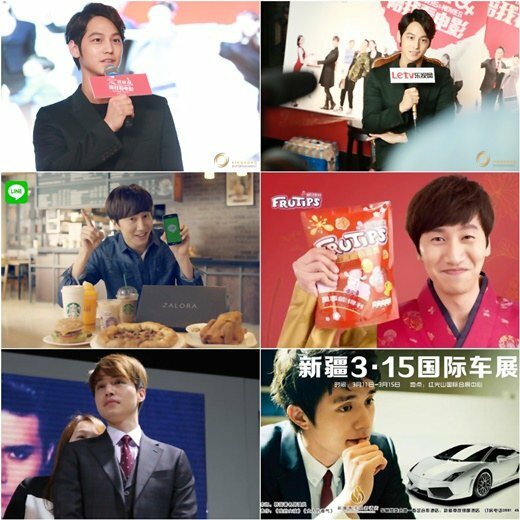 Lee Kwang-soo was recently chosen as the first foreign model for Hong Kong's Nestle Fruitips. His face and Korean words are imprinted on the product itself and apparently the whole idea was made with Lee Kwang-soo in mind. He is also the model of LINE in Malaysia. He visited Malaysia last year and was greeted by an amazing number of fans. Lee Dong-wook has formed a steady fan base in Japan and China with his former dramas "My Girl" and MBC "Hotel King". Also SBS TV show "Roommate" is viewed by everyone in the Asian region. Lee Dong-wook was invited to the Chinese Shin Zhang International Conventuon Center Motor Show. Thousands of fans gathered to greet the actor as soon as he appeared and the event had to be put on hold. Kim Bum, Lee Kwang-soo and Lee Dong-wook belong to the same company but stand out amongst each other in such different ways. Out of the 50 Hallyu star Weibo users, Lee Kwang-soo ranks 17th in followers and Kim Bum 27th. Meanwhile, Kim Bum is returning this June with the tvN drama "Hidden Identity" as human weapon Cha Gun-woo. Lee Kwang-soo is coming back with a Chinese movie and will appear in a Chinese TV show this June. Lee Dong-wook is looking through offers for his next project. "Kim Bum, Lee Kwang-soo and Lee Dong-wook, third generation Hallyu Stars"
Ji Jin-hee, Choi Si-won and Cheung Hok Yau to star in "Equator"
Lee Jung-jin to star in "Eun Ha"